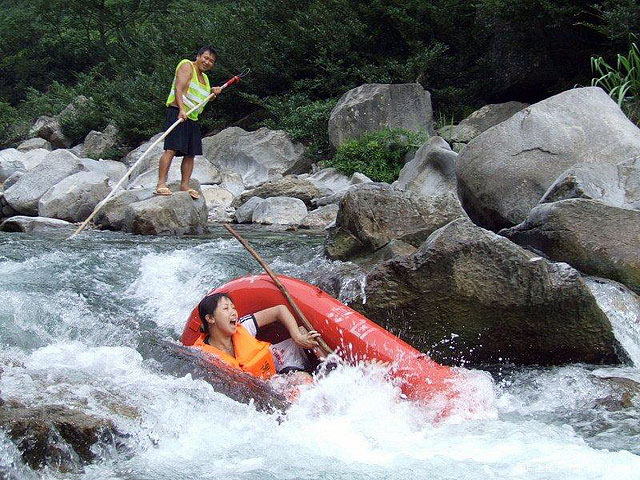 Located in the spring tourism resort, east of Longsheng County, 110 kilometers from Guilin city, Yanmen Gorge Rafting is a National AAAA Tourist Attraction. It is a comprehensive tourism course which integrates rafting, leisure, vacation and expedition. The drift river section is 7 kilometers long, made up of four dangerous shoals and eighteen rapids, with a total river fall of 78 meters. This section is regarded as an ideal river section for rafting, featuring abundant shoals, rapid river bends, varying river falls. Roaring in between the breath-taking mountain ranges, the torrential currents make an ideal place for rafting throughout the course, which is a great experience, thrilling but not dangerous, challenging but amusing. In addition, the marvelous wild scenery along the valley makes the rafting more interesting. undulating tops of high hills, wild green forests, fogbound cliffs ridges, deep and narrow riverbed, all of these create a mysterious atmosphere of the nature, which contributes to visitors` desire of conquering as they drifting. During the rafting visitors will pass Longsheng Spring National Forest Park and One hundred-meter overbridge, plank road along a cliff, etc. The iron-chain overbridge spanning over the Yanmen Canyon is 120 meters long, 1.5 meters wide and with a suspension height of 90 meters. Standing on the bridge you may be excited to enjoy a distant view by ascending such a height.